What better way to teach alien intolerance than with a computer game where you can shoot down members of the opposite species? 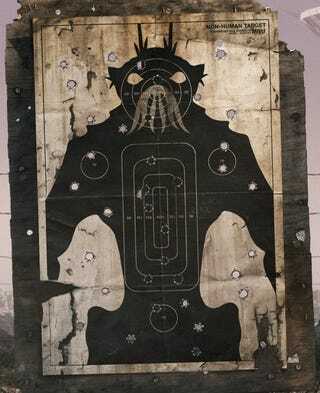 A new District 9 game pins you against either aliens or humans, guns blazing. The District 9 computer game has you running around squashing an alien uprising as a human, or gathering fuel cells as an alien bug creature who's stuck on this planet. As an alien, you're warned you'll either be arrested or shot if caught, but those MNU officers always shoot first and ask questions later. I wonder if there'll be an actual fuel gathering alien resistance in the film? We know from the trailer that the illegal aliens are out of fuel. Are the Earthlings holding out on them? Here are a few screen grabs from the new District 9 game, where tolerance is best learned at the business end of a rifle.